Money Kumar appears in a flash! Money Kumar: You want to learn even while on a picnic? Children: No Money Kumar. We have a problem. The ice-cream seller refuses to give us ice-cream saying that the money we gave him is spoilt. Can you teach him a lesson? Money Kumar: Are you crazy? Money Kumar: Because there's a very simple solution to your problem. Money Kumar: Come with me. I'll show you! 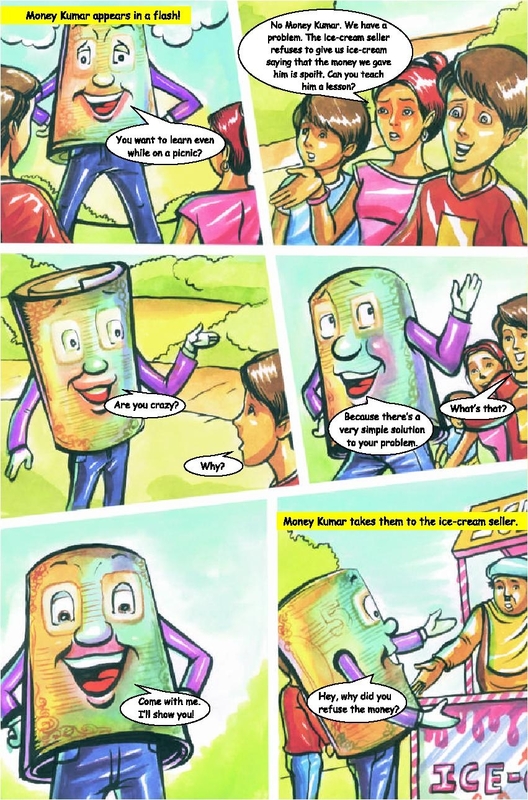 Money Kumar takes them to the ice-cream seller. Money Kumar: Hey, why did you refuse the money?